Sisteroos, since you all know that my baking ranges from "moderately edible" to "dumpster-worthy," I had to come up with a creative way to compete with you on equal terms. 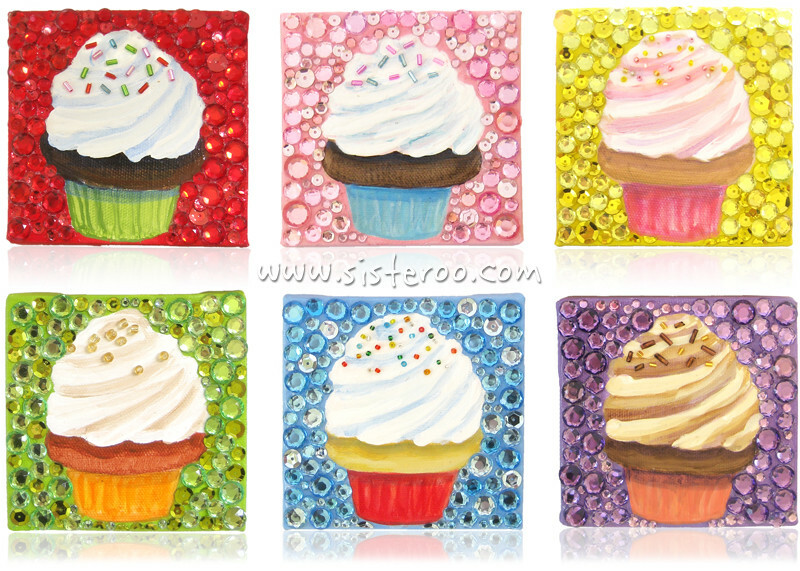 So I "baked" up a batch of my sparkliest gemmy cupcake paintings just for you. Creamy acrylic paint "frosting," rainbow glass bead "sprinkles," and utterly gorgeous gemstone-encrusted backgrounds. Eat your hearts out, ladies... Read more for the recipe. 3. 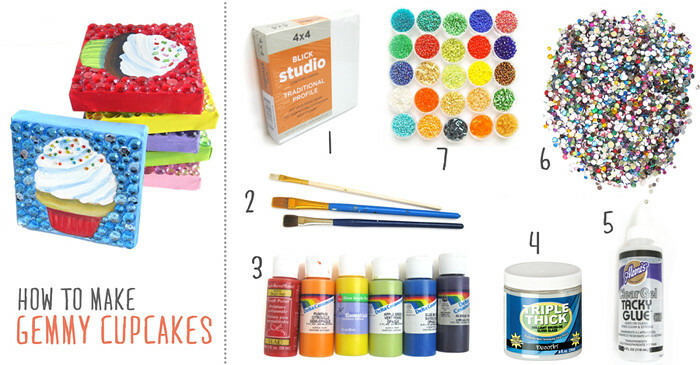 Grab some acrylic craft paint, and paint a delish cupcake! For the background, choose a color that somewhat matches the gemstones you'd like to use. 4. Wait for your cupcake to dry, then cover just the cupcake (not the background) with a nice thick coat of brush-on gloss glaze (I used Triple Thick). This protects your work, in addition to giving it a shiny sheen and some fun texture. 5. Apply clear glue to the background of your painting. I use Aleene's Clear Gel Tacky Glue. 6. Stick acrylic or glass gemstones into the glue. The cheapest places I've found gemstones is Joann and Hobby Lobby (bring a 40% off coupon, and purchase the massive 1 lb bag sold at these stores). 7. Glue glass beads, sequins, glitter, etc. to the cupcake frosting for a fun finish. shoes, cupcakes, art. LOVE. Way to go and be the most creative and talented women I have ever known. Would this be a lesson I can do with my 3rd grade students? If so, could I get step by step directions or any special tips? Thank you very much! Beautiful and smart project!